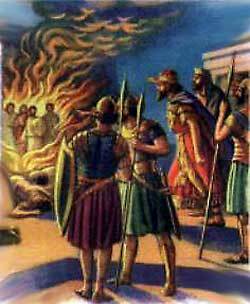 Nebuchadnezzar sees four men, unbound and walking freely about in the midst of the fire. NEBUCHADNEZZAR, THEking, grew in power until he became the greatest king in the world at that time. Year after year he added new countries to his kingdom, and in every country the people feared him greatly. These things caused him to become very proud, and to think himself a wonderful man indeed. Then Nebuchadnezzar decided to make a god and compel the people of every country to worship that god. So he built a great image, ninety feet high, and covered it with gold. This image he set up on the plain of Dura, which was near Babylon. There it could be seen at a great distance. After the image had been set up, the King sent a command to the princes and rulers and officers in every nation, that they should come to the great gathering on the plain of Dura. And they dared not disobey. When they came together, Shadrach, Meshach, Abednego, Daniel’s three friends, were among them. For some reason Daniel himself was not there. And now these jealous Chaldeans watched to see if Daniel’s friends would kneel before the image. When they saw the young men standing bravely alone among all the kneeling princes and nobles, they hurried to tell Nebuchadnezzar.